And the best part is that she’s not preachy. With plenty of room to garden and forage, Deanna has wonderful recipes for “putting up” or preserving as much as she can. Queen Anne’s Lace Jelly – What?!? No she didn’t. Bread and Butter Pickles – I am a sucker for a good pickle. I’ll definitely be making these! As a kid we had our own little homestead in upstate NY. The 40-acre property a few outbuildings, apple and pear trees, lots of wild grapes and plenty of room for a garden. In a perfect world I would live in a little farmhouse – complete with a little red barn like the one at Silly Goose Farm. 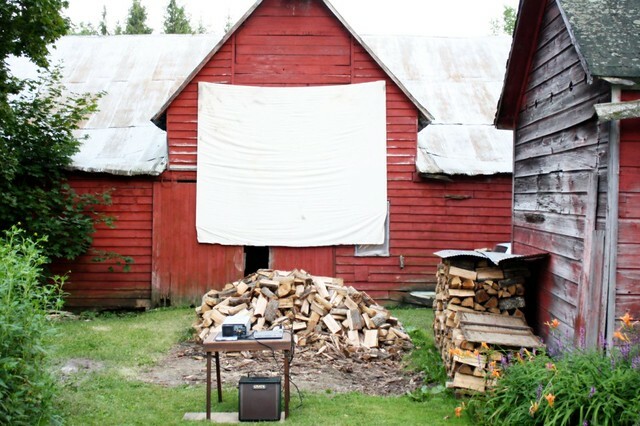 Barnside Movie Night at Silly Goose Farm. Sounds like fun, right? And who doesn’t like a cheese tasting party? This looks like the ultimate cheese tasting party. At least it inspired me to throw one. I might even duplicate Deanna’s menu. Finally, thanks to Silly Goose I can now justify my flea market and second-hand store purchases as part of my plan for sustainable living. Vintage glasses – perfect for entertaining. Clicking on any of the above photos will take you to that post. I have a feeling that after checking out Deanna’s blog, you’ll want to live the Silly Goose Farm way of life. *blushing* WOW! Thank you SO MUCH Kim! I am beyond flattered. Your words are too kind! !